Taking just 8 days 17 hours and 39 minutes to traverse the Indian Ocean, the maxi trimaran Groupama 3 skippered by Franck Cammas has snatched the record held by Orange 2 since 2005. 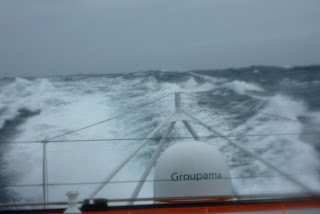 At 2322 UTC on Tuesday 23rd February Groupama 3 crossed the longitude of Tasmania, to the South of Australia, which marks the exit from the Indian Ocean and the entry to the Pacific Ocean. Having rounded Cape Agulhas off South Africa 8 days and 17 hours beforehand, Franck Cammas and his nine crew participating in the Jules Verne Trophy have taken 17 hours and 25 minutes less than the crew of Bruno Peyron some five years ago. With the Indian Ocean behind them, Groupama 3 is now attacking the largest ocean in the world, the Pacific; the exit from which is marked by the much renowned Cape Horn. 8 days 17 hours and 39 minutes, that is 17 hours and 25 minutes faster than Orange.